It all started in December 2009 when an old fishing boat, in need of complete restoration was delivered to the quayside in Conwy. 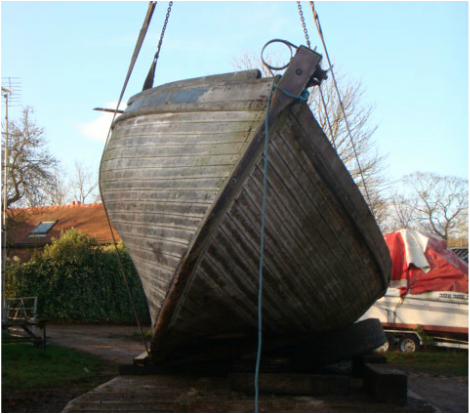 The delivery flagged up the return of boat building which was first seen in Conwy over 150 years ago. The Helen 11 is a wooden fishing boat and was built in 1910 by Crossfields. Conwy was the home of John Crossfields’ boat building enterprise, which extended to a number of locations along the coast of North Wales and Lancashire. They would often travel up and down the coast building boats on the beach for people, and it is said that they would produce a boat in six weeks, using timber sourced near the site and with only 6-7 men. These boats are called Nobbys, which is a colloquial word for rough wood, but they are identifiable by their sleek lines, low freeboard and beautiful counter stern. They are also called Prawners as that was the catch for subsistance fishermen and they were built for speed to get the catch back to harbour and achieve the best price for the freshest fish. Their low freeboard allowed the men to haul in the nets, with their bare hands, just using the roll of the boat in the sea. They only had the use of their sails, with topsails for light winds, to get home, as engines were not fitted until the 1930’s. ​Before arriving at Conwy, the boat was previously owned by the Roddick family who are great enthusiasts of the Nobby class boat. They have generously donated the boat to the Community of Conwy in memory of Jamie Roddick who tragically died of cancer at the age of 34. “The Helen II was constructed for George E Stonall of New Brighton. She is 40 feet long and of oak frame and pitch pine construction. As well as being a working boat, she also has a long history of successful racing awards. In 1914, she was the RMYA regatta winner in the fishing boat class and in 1920, the winner of the Liverpool Yacht club regatta. In the December 1930, the Helen II went missing as a result of a storm in Liverpool bay. She was eventually rescued from the Queens channel, with the help of a New Brighton lifeboat and was subsequently purchased by Ludwick Anderson of Port Maddog. She spent the next 10 years in waters off the welsh coast, around Port Maddog and Bangor. In 1943, she was purchased by Jackie Martin of Fleetwood and worked off the Lancashire coast under various owners until 1999 when she was acquired by us”.